What month are you due? Beach holidays with the family are lots of fun aren't they? Except of course when you have young children and 'holidays' also mean a lot of work for the parents. From the argument-inducing packing of the car, to sandy bananas and poo-filled nappies on the beach, there are lots of frustrating and tiring moments when you swap the comforts of home for the joys of family holidaying. 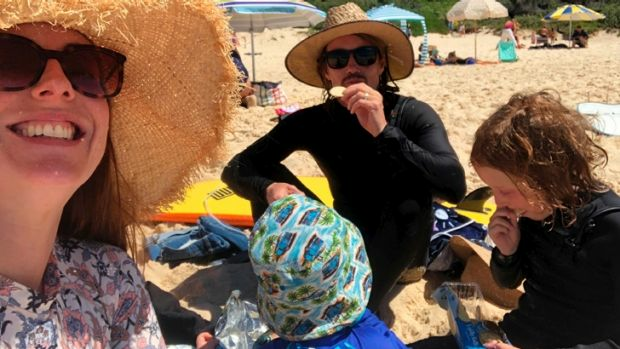 After returning from a week at an idyllic beach resort on the NSW coast with my husband Jules and our two boys Toby (8-years-old) and Leo (22-months-old), here are six of the best tips I discovered that I hope might help other toddler parents to survive and even enjoy, a family holiday to the beach. A beach holiday without airline baggage limits equates to epic amounts of stuff to pack into the car. There are surf boards, wet suits, Eskys, scooters, helmets and every manner of outdoor beach toy as well as all the normal toddler accompaniments such as travel cot, high chairs and favourite toys. We had bags under feet, stuffed between children and carried on laps. There were arguments about who packed and forgot what, and why there wasn't room to bring the bikes. One advantage of taking our smaller car was that Leo and Toby couldn't see or touch each other, so there was no teasing during the drive. Next year however, if we still haven't upgraded to a new (larger) car then a trailer or roof caddy may be required. On one of our last holiday days, we attempted to visit a secluded beach that required a 15-minute drive on bumpy dirt roads as well as a further 10-minute walk to reach. It doesn't sound like much of an effort pre-kids, but considering we had to carry our giant beach bag, beach toys, two body boards, a surf board, and a toddler who was refusing to walk, and you can understand why it was all a bit much. As we finally reached the beach and climbed a little dune to get our first view of the crystal blue waters, Leo crouched down to take a huge poo. Had we bought a change of swim nappy? Nope. Was there a toilet facility on this idyllic secluded beach? Nope. Needless to say, I was hot, sweaty and cranky that we hadn't kept it simple and gone to one of the many other splendid beaches much closer and more easily accessible from our resort. Toddlers love to snack and even when on the beach after a full breakfast there will be a time you need to placate a cranky, sandy infant with some calories. We discovered that packs of popcorn and rice crackers work well as they can apparently still be eaten and enjoyed with a touch of gritty sand on the side. Blueberries are a good non-wet type of fruit that won't get instantly ruined by a touch from a small sand covered toddler paw but sadly (and dramatically) we lost many a good banana to a sandy grave. All that time with your own family might appeal to you but to me, a week without home comforts and a toddler means I can go a little stir crazy. Luckily for us we travelled with an extended family group, meaning there were plenty of cousins for our two boys to play with all day long. We shared the cooking and feeding kids duties and always had plenty of helping hands to distract and entertain the kids with games of cricket or cards. Jules and I took it in turns to have some 'adult only time' doing bush walks, surfing or drinking coffee in peace and this was a fantastic sanity-saver. All that sunshine, sand and sea can be a lot of fun, but with some quite strong currents, dumpy waves and water temperatures around 17 degrees, the resort pool and spa were much more popular with the youngest family members. The pool was warmer, there was no sand to annoy anyone or get stuck to bananas and it took a lot less time to get changed and ready to roll. The proximity to ice cream at the resort café was also a plus. On the list of things 'mum forgot to pack' was the new pair of full body swimmers for Leo that I left on the bed at home. These long-style swimmers are great for sun protection but if we swam twice a day, Leo's only pair were still damp on the second outing, causing tears and logistical issues for me as they were much harder to fit his wriggly form into. In spite of the beach poo incident and multiple sandy-toddler meltdowns, we had a fantastic holiday and as I look back at the photos and see our smiling faces I know we'll be booking in another summer beach vacay next year. Need a nanny or babysitter?